Anfione and Niobe, the king and queen of Thebes are caught in a multiple plots twists and turns. Two other royals love Niobe: Prince Clearte and the prince of Thelassy Creonte. Creonte who intends to attack Thebes, is traveling with Poliferno, a magician, who has enthralled him into believing that he too is in love with Niobe. The comic foils of Nerea, Niobe’s nurse, stresses the exploration of the human soul in its dilemma – that of being earthbound. Manto, an innocent young maiden, is rescued from a bear attack by Tiberino, a traveling prince, and while they take time to confess their love, Tiresia, Manto’s father and the blind priest of the Goddess Latona, predicts the doom of Thebes and the outcome of the Thebes-Thelassy war. Creonte, disguised as Mars, is successful in duping Niobe and her subsequent arrogance and frivolity raises the ire of the Gods. The God Apollo and the Goddess Diana, masquerading as an agency for the forces of authority, descend among the mortals to exact their revenge, condemning Niobe to her fate. 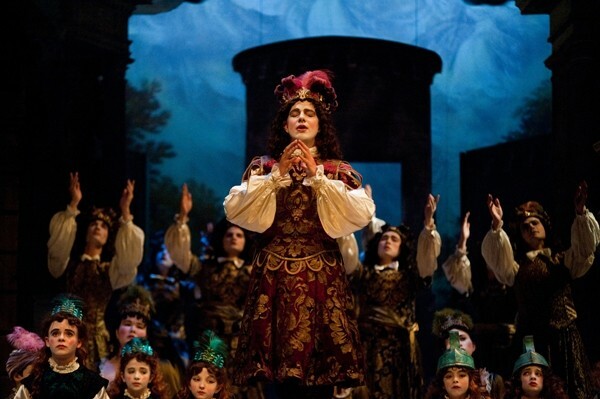 The richness of the score and the libretto’s mythological elements are enhanced with such visual moments as the cascading clouds to Deus ex Machina interventions when the Gods descend from Heaven to seduce or condemn Niobe. Mr. Blin’s extensive personal etchings collection of Maximilian II of Bavaria, the Goddess Latona and others subjects related to the opera enhance the historical documentation. The festival is also indebted to Professor Colin Timms of the University of Birmingham and Steffani operas’ ubiquitous expert for archival research, precision and accurateness. 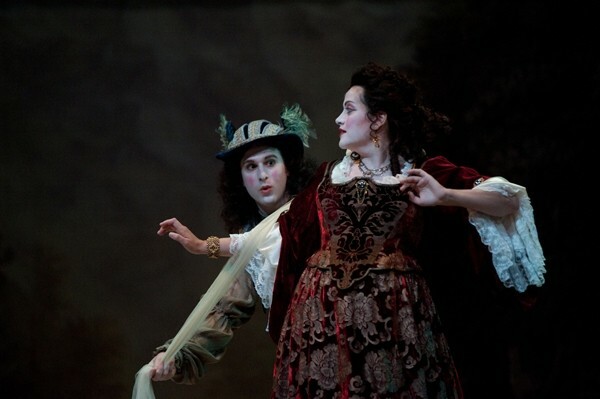 Interspersed with numerous dances (French in rhythm), Caroline Copeland and Carlos Fittante’s choreography imbues the opera in the baroque style. The dance poses depend on contrapposto (“counterpoise”), where the tension within the figures that moves the planes of shoulders and hips is in counter directions. These contrapposti transmutes with great fluidity the dancers’ bodies into sculptural forms. They are also accompanied by a talented children’s troupe. 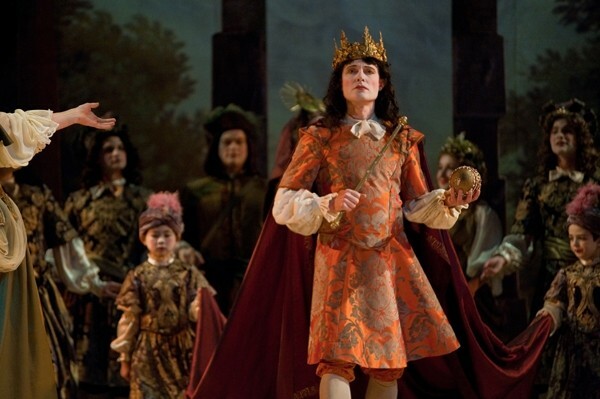 Anna Walkins’s costumes richly hued, velvet golden patterns of Cintamani and Kashmir inspiration and the Heliopolis-shape headsets contrast with the dramatic staging. Both Paul O’Dette and Stephen Stubbs Emmy award winners and the festival directors (playing respectively – theorbo and Baroque guitar – share equally in conducting the Boston Early Music Orchestra, to the delight of early music lovers. 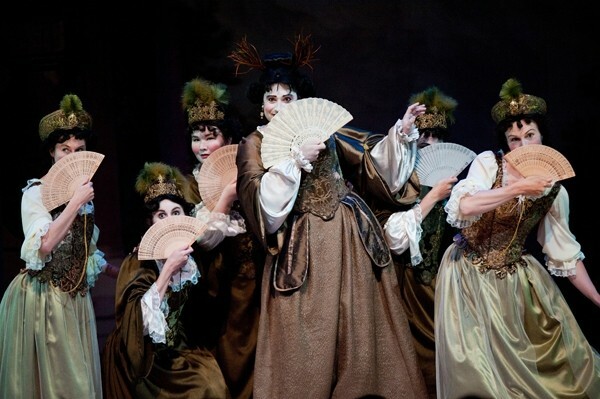 Their music expands the size, range, and complexity of instrumental performance particularly where each of the opera character is often assigned his or her own instrument – Anfione accompanied with the virtuosity of a small strings and viola de Gamba, and the nurse Nerea singing her earthbound arias with the artistry of recorders. “Niobe, Regina di Tebe,” ran through June 19, 2011 at the Cutler Majestic Theater of Emerson College and comes to the Mahaiwe Performing Arts Center, 14 Castle Street, Great Barrington, MA, on June 24 and 25, 2011; (413) 528-0100. http://www.bemf.org.